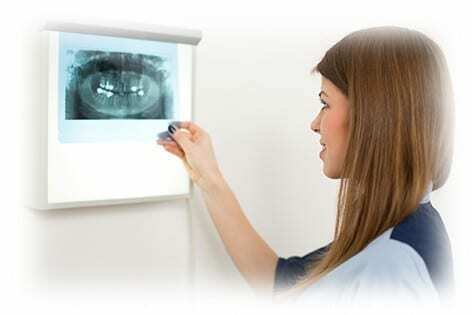 In addition to the standard examination with a dentist’s (mouth) mirror, what gives your dentist a much better insight into the overall condition of your teeth is a pantomogram – in digital X-ray technology. By digitalising the pantomogram, the time of exposure to X-rays is reduced, which makes the procedure safer for the patients. This digital technology enables scanning of individual teeth, craniograms for orthodontic diagnostics and of the temporomandibular joint. The scanning process is short, painless and safe for the patient. During the scanning, the patient should be protected by a lead apron. Pantomogram may help the ORL specialists if there is suspicion of a disease of the maxillary sinus. In the adolescent period, to determine the position of the wisdom teeth in case there is a need for them to be surgically removed. The scan be momentarily displayed on the computer screen, it can be sent by e-mail or transferred onto a USB flash drive or CD. Digital scan is very precise for all the displayed strictures, which gives insight into more details and enables better diagnostic application. Pathological processes around the root of the tooth are identified more easily, as well as the condition of the bone in the early stages of periodontal disease or lesions on the teeth caused by dental caries. Pantomogram also enables timely diagnosis of teeth and jaw diseases. Specialist office MND Dental was founded in 2010 as heritor of the general dental practice „Dr Djuric“ which was established in 1992. as one of the first private practices in Belgrade. We are widely known as experts in jaw orthopedics.